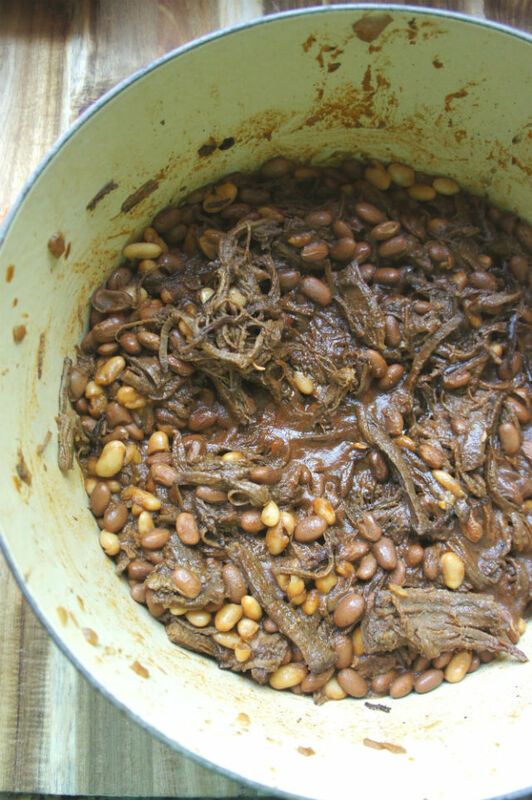 If a sweet pulled brisket got married to a can of baked beans, this dish would be their delicious baby. 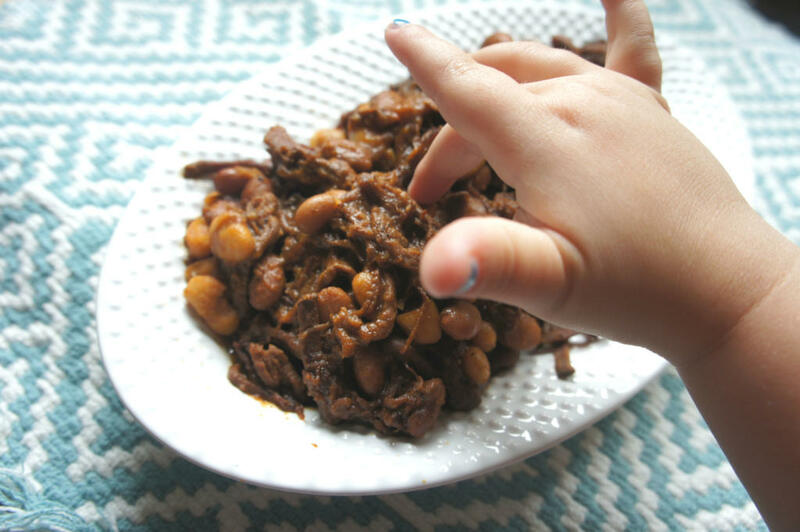 I love baked beans, right out of the can, all summer long for cook-outs and backyard parties. It reminds me of my childhood, not to mention it’s just straight up easy and cheap. You can totally follow all my steps below. You could also put a brisket in a slow cooker with some water, a bottle of store-bought barbecue sauce and maybe an onion. After 3 1/2 hours, add the rinsed, drained cans of beans, and voila: dinner. But this version is also pretty delicious, and received both husband and child’s stamp of approval. In the case of my 4-year-old, quite literally a finger right in the dish. Make it for dinner! Bring it as a side dish! Put it on a sandwich! Because “there’s too much brisket at this picnic” is something you will never ever hear. In a small bowl combine paprika, salt, pepper, cinnamon, cumin and garlic powder. Rub onto each side of the brisket. In a large Dutch oven, heat a few Tbsp olive oil on medium high heat until its glossy, and the pan is hot. Cook brisket on each side for 4-6 minutes, or until caramelized and deep brown. Remove from pan and set aside. Turn heat down to medium. Combine water, ketchup, cider vinegar, mustard, brown sugar and molasses in a small bowl. Cook onion 7-10 minutes, scraping brown bits off bottom of pan. Add heaping pinch of red pepper flakes. Add half the can of beer to deglaze. Pour in the ketchup-water mixture and bring to a simmer. Add remaining beer. If sauce looks to thick now, or at any point, add 1/2 to 1 cups water. Reduce heat to low and cook for 3-4 hours, checking periodically. Remove from heat and allow brisket to cool. 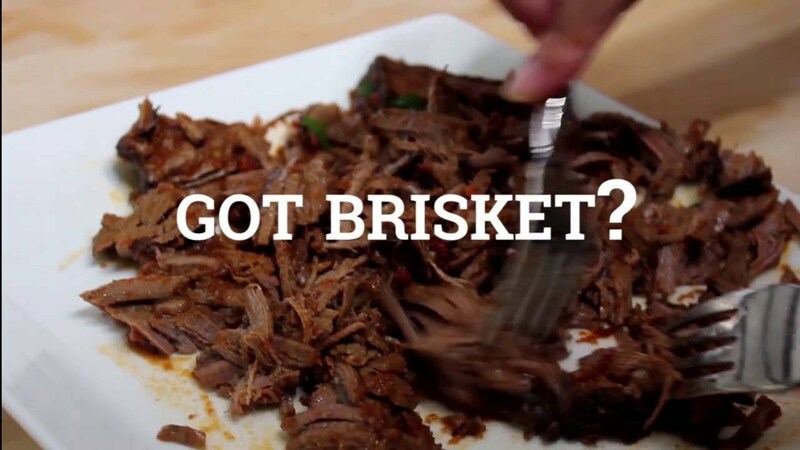 Place on a cutting board and using two forks or a fork and a knife, shred brisket. Keep sauce in pot and put back on heat on a medium-low flame. Rinse and drain the cans of beans and place in pot, stirring to cover with sauce. Put meat back in the pot and cook another 15-20 minutes. Everyone gets excited when brisket is served. 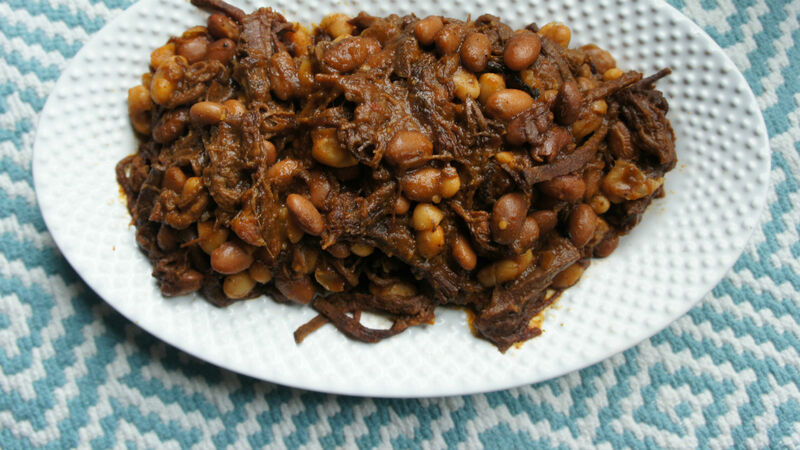 But sometimes you don't want to wait until the holidays to enjoy this beloved dish.